Starting the week off a bit late on the blog, here: this afternoon we will be doing screen printing with Jackie! If you have a design that you would like to put on a shirt, we can help you do that. 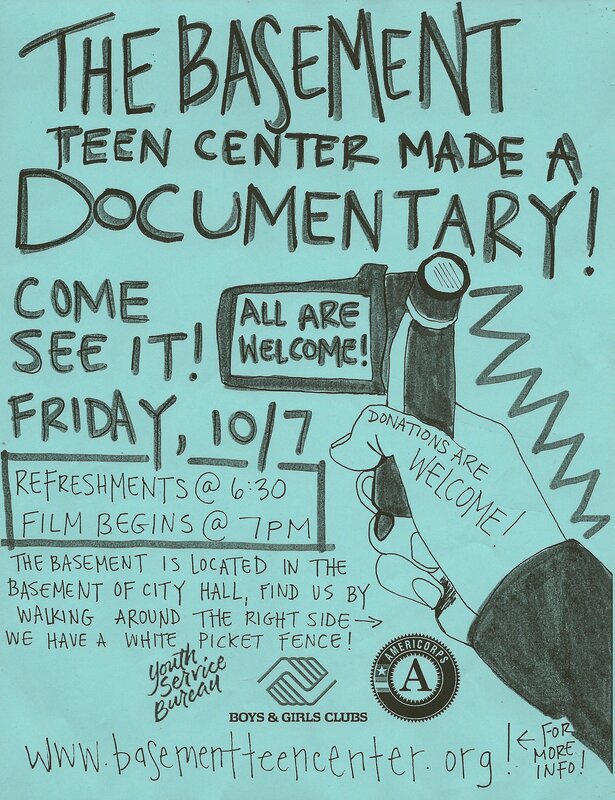 Also, if you have any ideas for the DVD cover for the Basement’s documentary, we would love your input. WEDNESDAY we will have a special challenge for you, check our facebook page tomorrow. THURSDAY there will be a meeting about the short film we will be making this Fall. Come down if you have ideas for a story or want to play a role in the film otherwise. The Emily’s bridge idea seems to be the prevailing one. If you’ve heard any stories about Emily’s bridge, we want to hear them. If you’ve never heard about Emily’s bridge before, ask around, or maybe you could make up a story. And there are plenty of roles we need to fill. We’ll need actors, cinematographers, sound people, story boarders, directors, writers, grips, costume designers and more! Tell your friends! We would like to submit this for next year’s Green Mountain Film Festival! We will also be selling copies of the documentary on DVD for $5!